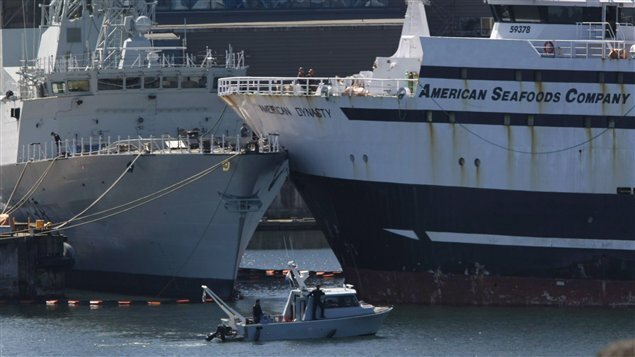 The American Dynasty (right) collides with the docked HMCS Winnipeg which has just undergone a massive refit and upgrade in Esquimalt, British Columbia. A U.S. fishing trawler hit a Royal Canadian Navy Frigate on Canada’s west coast yesterday slightly injuring six people. HMCS Winnipeg was moored at a jetty used by the nearby Esquimalt base. The American Dynasty trawler was leaving a ship repair dock nearby. It was being led out by two tug boats when something went wrong. Esquimalt is located on Vancouver Island on Canada’s Pacific coast. “They were backing it out in the harbour and as they were sort of swivelling the bow around, this thing sort of shot forward and slammed into the bow of the Canadian navy vessel,” said eyewitness Larry Edwards. Navy officials refused to comment beyond saying they would investigate the incident.